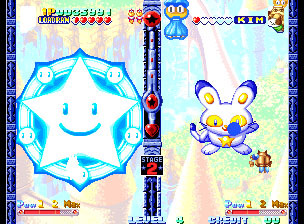 If, for some reason, you wake up one day to hear yourself saying, "You know, I could really go for a rapid-fire shooter with adorable Japanese characters that uses the mechanics of a puzzle game," well, first it'd be good to see a psychiatrist. 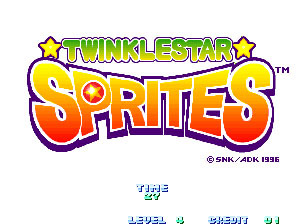 If you get a clean bill of health, then your next course of action should be to buy Twinklestar Sprites, one of the more unusual shooters the Neo has to offer. There's this girl, see, and she's apparently some kind of a witch girl, because she rides a broomstick and has a hybrid rabbit/cat named Rabikat...and...she's trying to get the magical Twinklestar so she can gain wild magical powers...or something. You know, your guess is as good as mine. I tried to figure this out for a while, but all I know is it's cute and violent at the same time. You fly around to cleverly titled places like Cloudia and Freezia, shooting clams and snowmen, and beating the snot out of other adorable creatures, some of which look a bit like Tribbles. Beat enough snot and you'll get the Twinklestar and ditch the broomstick for genuine fairy wings. It's every girl's dream, apparently. 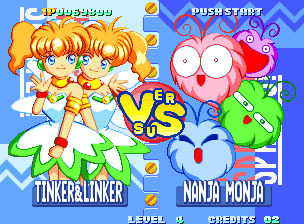 And for whatever reason, the Japanese title of the game adds a space between Twinkle and Star, while the English version smashes it into one compound word. Go figure. The gameplay is as weird as the set-up. TSS is a strange but satisfying hybrid of a vertical scrolling shooter and a puzzle game. 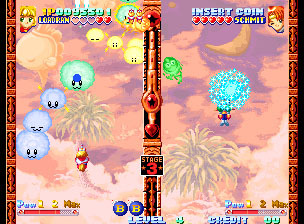 As you blast the creatures that fly in formations ahead of you, their colorful, firework-like explosions set off chain reactions, blowing up the other folks around them. These chain explosions send nasty little ghost-things--the disembodied souls of the creatures you just obliterated!--over to the other side of your screen and attempt to dive-bomb onto your opponent. If your opponent shoots them fast enough, they head back over to you, only meaner than when they left. 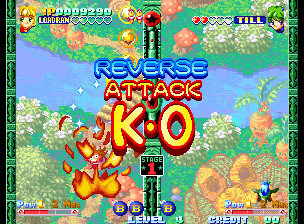 You can wipe out everything on the screen with an adorable bomb, but you won't get any chain explosions that way, and therefore no direct attacks on your opponent. 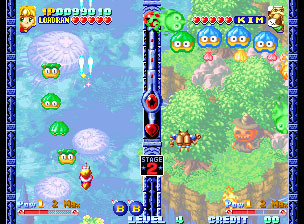 The key, then, is to time your shots (that's the shooter part) with the formations of the floating fodder, so you can make them all go boom in a row (that's the puzzle part) and do damage to your foe. There's a lot going on at any one time, and the pace is surprisingly fast. You've really got to be paying attention to make any sense of things, let alone use strategy. But that's a good thing. Thankfully, the controls are up to the task--as with most Neo shooters, you'll enjoy precise eight-way movement and uncomplicated attack and bomb buttons. J-pop disco. Love it, hate it, or ignore it. No matter what, you probably won't walk away humming. It's nothing special. I honestly can't think of another MVS cart (or any game for that matter) that combines shooter and puzzle elements in quite this way. The fast pace really appeals to your inner twitch gamer, while the puzzle strategies lurk below the adrenaline to give the game some mental depth. The AI leaves a little to be desired, but as a two player game, TSS excels. 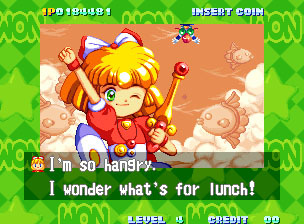 Yes, it's another in a disturbingly long line of hyper-cute games for the Neo...but Twinklestar Sprites is nothing if not original, and the hybrid gameplay is hearty enough to make you suffer through the saccharine. Unfortunately, its steep price (expect to pay no less than $100 on MVS, and literally ten times that amount on AES) will probably scare all but the seriously dedicated (or seriously rich) shooter fans away, and you can't help but think, for that amount of cash, it's simply not worth it. But market value be damned--TSS is an enjoyable odd duck nonetheless.